25+ years ago friends were sitting around John Norton's Phoenix shop drinking beer and decided they really should be able to drive to the fridge to get a beer. 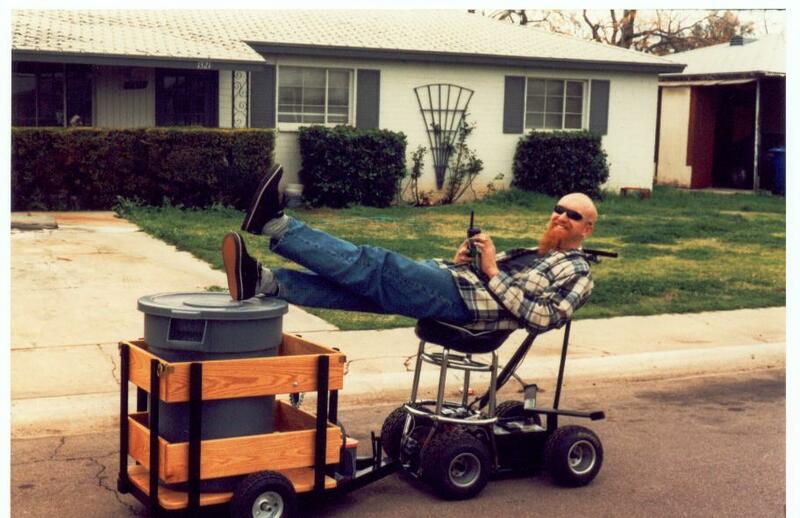 The next day a shopping cart donated its wheels, an old triumph starter motor its heart, and the alcohol induced dream began to become a reality. 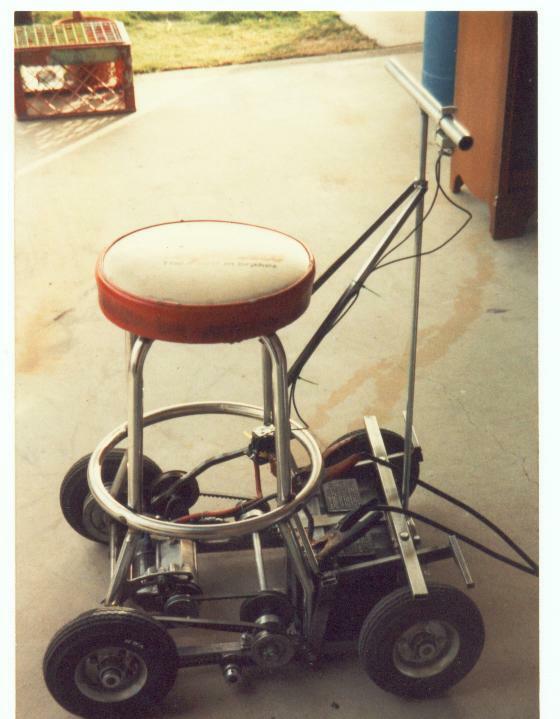 The first AZ barstool racer was fairly crude, using a door hinge to pivot the motor and tighten a v belt to drive one rear wheel. The new toy was brought to a Christmas Party at Greg Whites plastic shop, as the evening progressed a warehouse full of racers began placing bets on who could drive the barstool the fastest. An impromptu autocross course was set up in the warehouse, and the stopwatch came out. The next year there where 4 barstools at Greg's Party, the year after that 7, and within a few years there would be about 60 electric barstools racing in and around Phoenix bars, parking lots, warehouses, and dance floors. John Norton created Thunderstools and built most of the early barstool racers at the same shop that spawned the idea. Over the coming years he would deliver quite a few of his creations around the globe. My father, Jim Aluria, and I put together a stool of our own design and began to play as well. Our barstool moved the belt tension pedals lower and over the front tires. 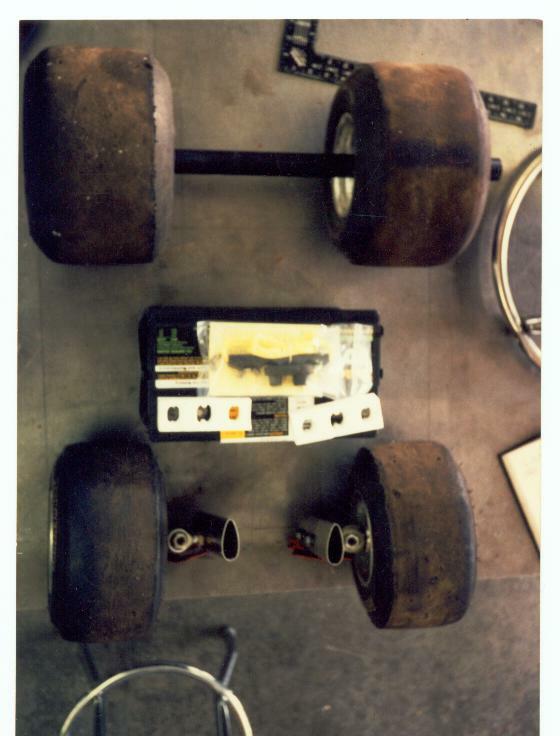 The lower foot positioning, and a switch to pneumatic tires helped improve lap times and drivability. A few years later I built my second barstool racer while working at a Phoenix race shop. Barstool 2 used two Toyota starter motors each directly driving one rear wheel, and also with independent rear brake drums. The design worked well for setting the chassis into the corner then powering through on the outside tire. 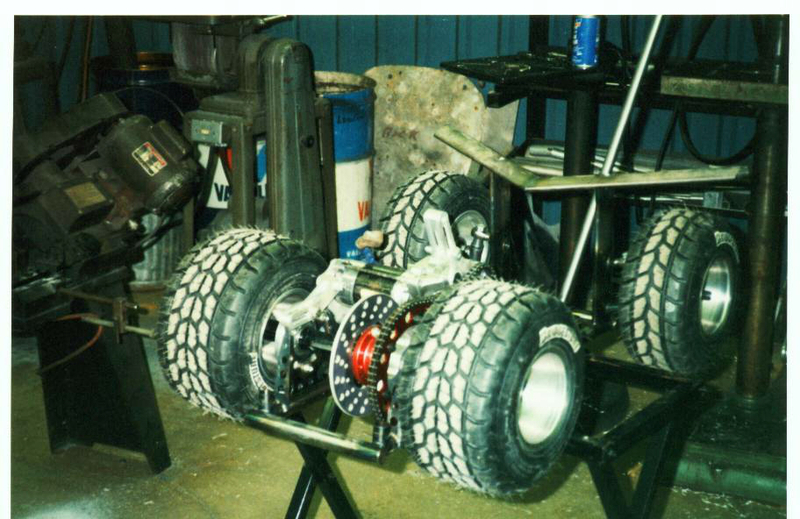 I later built a chain drive, twin motor, solid axle barstool nicknamed Space Junk by my Indy team mates. Evolutions continued, and over the next half decade electric barstools would be raced at the Bonneville salt flats, local dance floors, empty warehouses, parking lots, and on ice in America West arena. Lots of good times were had and a few adult beverages consumed. Big Chicken Barstools came into being when my former college room mate and I joined forces to manufacture gas powered barstool racers. Our intent was to build a fun vehicle for the race track that would be able to tow a car, pick up supplies, haul humans around, and take up little space in a trailer. Over the past 15 years we have built, quite a variety of barstool racers, tandem stools, barstool trucks, and off road stools. Several hundred barstools later we are still building custom barstool racers. Some of our most recent upgrades include hydraulic front brakes, splined steering assemblies, larger engines, and custom fuel tanks.